The first book I did serious research for was Trinity On Air. It was my second published novel. With my first novel, Trinity Rising, I was writing about what I knew, which was being a student at Rhodes University in the Eastern Cape. Trinity On Air was more complicated. The main character gets her first job working in the newsroom of a talk-radio station in Johannesburg. While I knew something about print media, having spent time in the newsrooms of Financial Mail, Business Day, Sunday Times and Style magazine, I knew next to nothing about talk-radio. My publisher arranged for me to spend a day at Talk Radio 702 in Gwen Lane, Sandton, to bring me up to speed. I was privileged to receive a tour of the newsroom and to be allowed to sit in on and observe John Robbie and Redi Tlabi host their respective shows. The news editor answered all my questions, and I came away with a treasure trove of insights about what it’s like to be behind the scenes of a talk-radio station. I couldn’t wait to share these with my readers. When I sat down to write it all up, I spared no detail. Every observation went down on paper whether it needed to be there or not. I’d spent so much time on research that I was determined not to waste a scrap of it. You probably won’t be surprised to hear that I ended up deleting ninety-five percent of what I had written. It turned out that my careful facts and observations weighed the story down like a millstone. This was my first real research as a writer, but most of it had to go. I had written myself a giant information dump, and managed to whittle it down to a few details that added colour and authenticity to the story. 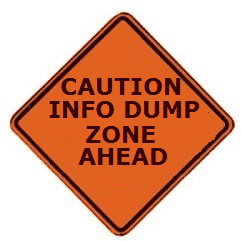 Information dumps can take many forms, not all of them having to do with research. Novel writing is a form of world-building, and there are always chunks of information relating to setting or back story that the writer wants to convey to the reader. There is a temptation to get that out of the way in the first few pages so you can carry on with telling the story. This is almost always a mistake. It is better to allow such details to unfold organically with the momentum of the narrative rather than dropping them all in the reader’s lap at once. This is Writing 101. It is something novelists are supposed to know. But readers are continually surprised by how many authors, even successful ones, fall into the info-dump trap. Avoiding the information dump became second nature to me until I started writing Spire, my fifth novel, which is unlike anything I’ve written before. It is a medical thriller set in an isolated research station at the South Pole. Clearly more research was called for than in my previous books. I thought I knew the drill – research the topic thoroughly, but only use about five percent of that information. It was only when I came to read over the first couple of chapters that I realised this was the wrong approach. Those passages where I had glossed over the scientific details in favour of character and dialogue were much less satisfying to read than the ones where I had allowed myself to go into technical detail. I had been regarding all novels as equal, when they quite clearly are not. There is a certain kind of procedural novel that demands much more granular detail than other thrillers. We are used to the word ‘procedural’ being used to describe crime novels that follow the police or private detectives in their step-by-step investigations of a crime. The tension in these stories derives from the puzzle-solving process. Readers relish attention to detail and have a high tolerance for facts. But it is not only crime novels that are procedural in nature. Certain medical thrillers depend on precise and detailed descriptions too, as do survival narratives. Whether it’s a post-apocalyptic scenario or an isolation situation, the reader wants to know exactly how the characters survive. It’s not enough to say “they found some food and ate it”. You need to describe a particular bush growing wild, give it a scientific name, explain how it survived the nuclear war, and describe its nutritional qualities. Robinson Crusoe is a satisfying read precisely because of the detailed descriptions of how Crusoe survived the shipwreck and kept himself alive on the island. His early failures and tiny successes make the book what it is. Long descriptions of his emotions and state of mind would not have been nearly as effective. Similarly, when I describe my main character treating a patient who has stopped breathing, it isn’t enough to say, “She performed a tracheotomy and the patient lived.” The reader wants to know where you make the incision – how deep and how wide – and exactly what happens next. This kind of detail doesn’t read as an information dump, but as the granular particulars that add texture and authenticity to a story. It is important to remember that not all novels are created equal. While they all deserve thorough research on the part of the writer, that research can usually be conveyed with the lightest of touches. But in the case of certain procedural novels, it needs to be layered on with a palette knife to create a thick and textural impasto.